This book contains Sri Bhagavan’s original poetic works and the translation of Smt. Tr. Kanakammal’s commentaries on them. Smt. Kanakammal is an old Ashramite who had spent four years in the immediate presence of Sri Bhagavan till his Mahasamadhi in April 1950 and thereafter had listened to the explanations of Bhagavan’s work by Sri Muruganar the great Tamil Poet and devotee of Bhagavan who had sat at the feet of his satguru and listened as he explained the import of his works. A staunch devotee of Bhagavan and gifted with a powerful memory kanakammal retained all that she heard from Sri Muruganar. Besides she is one of those who live by every world of Bhagvan. This book which is an authentic guide to Sri Bhagvan’s original poetic works has been hailed by Old Ashramites and other as a boon to all devotees of Bhagavan. The author has explained the meaning of every world of Bhagvan’s verses, the meaning of each verse ad added a complete commentary on it. She has also mentioned the circumstances in which each poem was written by Bhagvan. This is not just a work of scholarship but is the work of one to whom Bhagavan’s teachings are her life breath. Kanakammal’s book in Tamil Came out in 1990. By Sri Bhagavan’s Grace it has been Possible to make it Accessible to all English speaking devotees in the excellent translation of KAYS. 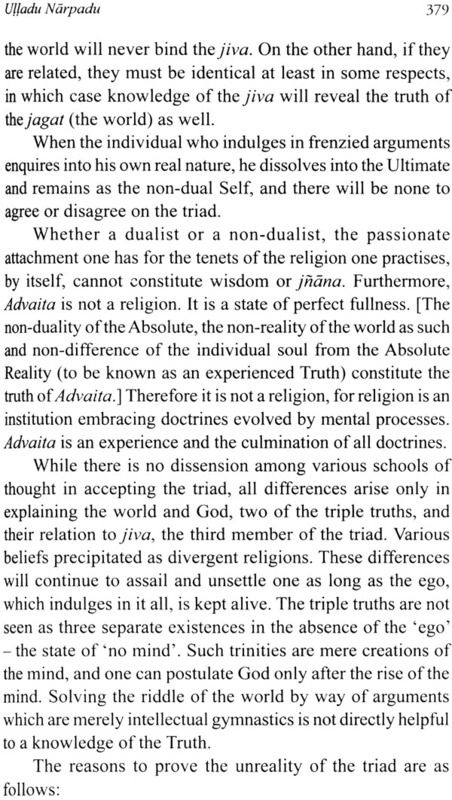 Sri Ramana Nul-Thirattu (The Collected Works of Bhagavan Sri Ramana Maharshi), comprising his works in prose and poetry and his translations of other sacred works, like some of the works of Sri Sankaracharya, is a golden treasury of wisdom, a beacon of Jnana that lights up the direct path to mukti (liberation), the goal of all spiritual seekers. Bhagavan Sri Ramana wrote little but each word of his packs a whole world of spiritual wisdom flowing from his own direct experience of Reality and his steady abidance in the Atman (the Self). He was essentially a Silent Sage but when he wrote or spoke, his words had as great a power as his unfathomable silence. Though Sri Bhagavan's works, simple and profound, are meant for scholars and the lay men alike, yet, his words which teach the Supreme Reality have to be read with deep attention and inwardness. An authentic commentary, therefore, from a devotee who had the privilege of knowing the Master and being one of the devotees who sat at his feet would be invaluable to readers who seek to comprehend the Master's spiritual teachings through his writings . Smt. T.R. Kanakammal, the revered author of this precious book, fulfils this requirement admirably. She has had the added advantage of having been a diligent student of Sri Muruganar, the great poet-devotee, author of more than3 0,000 poems of exquisite beauty on his Guru and God, Sri Ramana. Sri Muruganar, a devotee and Tamil scholar and poet of great merit, had been instrumental in eliciting and structuring many of the major poetical works of Sri Bhagavan and had the rare fortune of hearing these compositions expounded by Sri Bhagavan himself. After the Mahasamadhi of Sri Bhagavan, Sri Muruganar, in response to the request of devotees to elucidate the import of these works, held classes for six months. Smt. Kanakammal, the author of this book, regularly attended them and, being endowed with a sharp memory and intellect and intense earnestness, she absorbed the content of the classes and retained it in her memory. Later, she had the opportunity to serve the ageing poet-devotee and had the good fortune of receiving further detailed guidance on Sri Bhagavan's teaching. 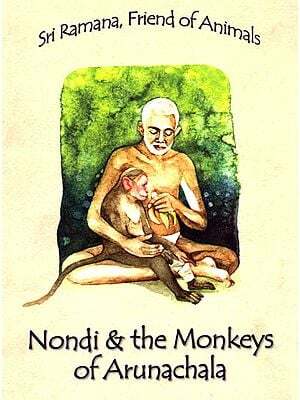 It was Sri Kunju Swamy, a close devotee of Sri Bhagavan and a couple of young devotees who persuaded an initially reluctant Kanakammal to go ahead with writing this book in Tamil in 1989. She completed it within a year and it was published as two volumes in 1990 and 1991, covering, Bhagavan's original poetical works (Upadesa Nunmalai) and his translations and adaptations (Anuvada Nunmalai). This is a totally authentic commentary on the timeless works of Sri Bhagavan. Old devotees like Professor K. Swaminathan and others hailed Smt. Kanakammal's work as a boon to devotees. It has gone into several editions. The need for an English version of Smt. Kanakammal's commentary was keenly felt. So Smt. Kanakammal's original manuscripts, which contain detailed information, were made available. Additional material was also drawn from her explanations of these works to devotees during satsangs with her in later years. 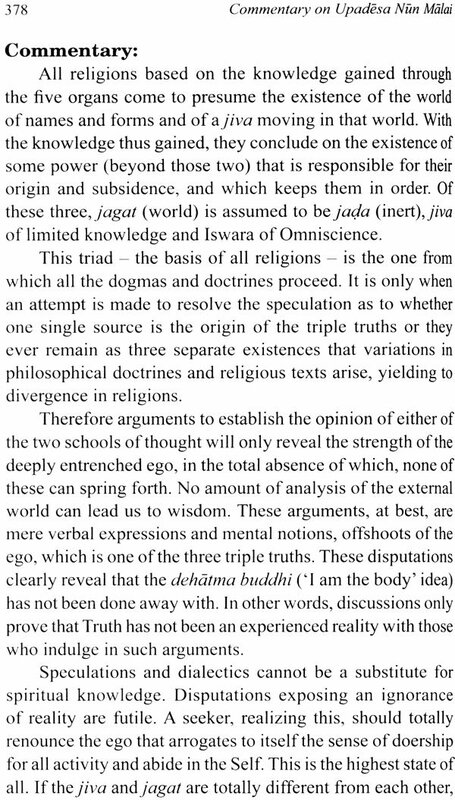 Wherever necessary, explanations in Sri Bhagavan's own words are cited as they were recorded in other books such as Talks, Letters, Day by Day, etc. The task of translating such an important book has been accomplished well by 'Kays'. Many other devotees have assisted in the manuscript's preparation and formatting. In this English version, the flavour of the original has been preserved and the core and contents of Smt. Kanakammal's work have been retained. The complexity and shades of meaning have also been meticulously included. Non-Tamil speaking readers will savour the depth of feeling and nuances in Sri Bhagavan's own works, which they would have missed otherwise. Devotees of Sri Bhagavan are indebted to Smt. Kanakammal for sharing this 'nectar' of Bhagavan Sri Ramana. We offer this flower-text at Sri Bhagavan's lotus-feet of Grace. Few are aware that Bhagavan was a bard of excellence as well. His mastery of language was not confined to his mother tongue, Tamil, but encompassed other Indian languages like Sanskrit, Telugu and Malayalam. Right from ancient days, sages of this land recorded their sublime spiritual experiences in verse form, with the noble motive of uplifting souls from samsara and this is the centre- piece of sacred Indian traditional lore. The unique greatness of bestowing his supernal spiritual experiences in verses of grace in all these four languages belongs exclusively to Sri Bhagavan, who was ever established in the sahaja stiti (the natural state) - a fact that all devotees of Sri Bhagavan can be proud of. The excellence of poesy of this Purna jnani (perfect sage) was not acquired by any formal learning but was born of the sphurana of the Heart. 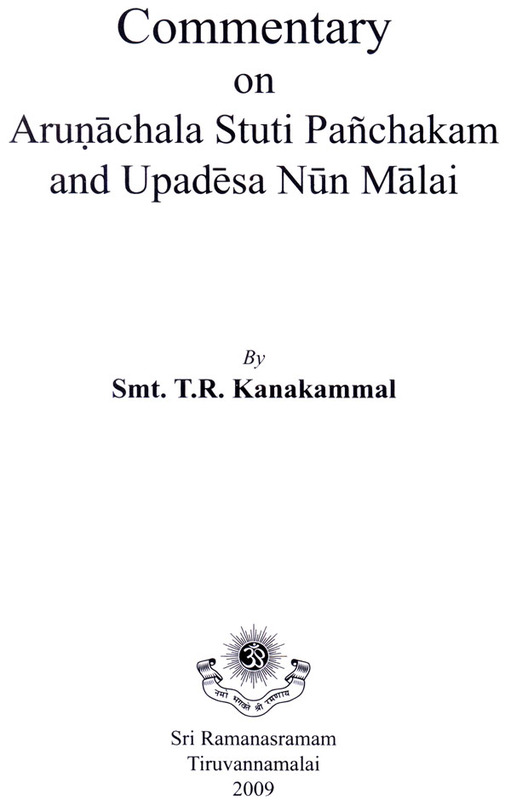 The original compositions of Sri Bhagavan, such as Sri Arunachala Stuti Panchakam, Upadesa Undiyar, Ulladu Narpadu and the Supplement, Ekanma Panchakam, Appala Pattu and Anma Vidya, as well as a few adaptations from ancient Sanskrit verses, have all been included in this volume with commentary by Smt. T.R. Kanakammal. Sishya-Parampard - the lineage of the disciples - is a tradition in Indian culture no less renowned than the Guru- Parampara. The family Kanakammal was born into was one that had surrendered to Bhagavan as Guru. Her uncle, Sri Ramakrishna Iyer, served as the munsif (Administrator) of Tiruvannamalai in those days. He was a devout bhakta of Sri Bhagavan. It is no wonder then that Smt. Kanakammal also became an ardent devotee of Sri Bhagavan. The glory of Sri Bhagavan's advent on earth lies in the gems of his upadesa that he showered on the community of devotees and seekers, all of which his collected works contain. This text of commentary is an excellent work that has brought out the content of the verses in prose, true to the original. Devotion to Sri Bhagavan will doubtless spring forth in the hearts of devotees who dive deep into this commentary. It is also certain that they will get immersed in the enquiry of 'Who Am I? ', the core of Sri Bhagavan's upadesa, gain Atma- Sakshatkara - the state of eternal release - and attain the bliss that transcends the frontiers of space and time.